Hail Greyhawkers. Today I'm perusing old Dragon mags again, this time delving into Dragon #37 an old issue indeed from May 1980. What makes this issue significant is that this is the release year for the World of Greyhawk setting (Folio). Up to and including this point, Gygax and company had worked up the D&D fanbase with news and tidbits about the RPG setting and that month's From the Sorcerer's Scroll column by Gygax summed up the current state of things, having had some false starts along the way. "Steve Carpenter of Miniature Figurines Ltd. is currently designing a set of miniatures rules for warfare on the World of Greyhawk. These rules will set forth the orders of battle of the states of the Flanaess and add to the information pertaining to the “World.” At the same time, miniature figurines of the various troops are being assembled, so that details of what various units look like will also be known—say the Overking’s Guards or the Knights of the Hart. In addition to having adventures, campaign participants will soon be able to fight major battles which will affect the course of things. The figure line could eventually number in the hundreds of sets, with possibly a thousand different figures. The initial release will be in the 50-set range, according to Steve. Of course, I’ll be contributing to the miniatures rules, and I’m helping to select figure types. The rules and figures will be significant contributions towards developing the “World,” but more is needed." 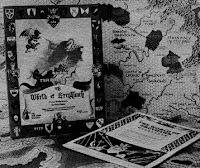 "Finally, as a bonus for reading through all of this, you will find same Order of Battle information for certain renowned figures in the World of Greyhawk. They will possibly appear in the general army lists, but then again they might not make it. Either way, you will have the information first." My guess is they would have been included. In fact, the heraldry on the cover of the Greyhawk Folio includes the green dragon standard of Robilar and the scimitar of Tenser for no other reason, but in the context of a war-game that never came out, these shields make more sense. The lists feature the forces of Bigby, Mordenkainen, Robilar, Tenser and enigmatic Unnamed Erac's Cousin. Each of the entries tease some interesting back-stories as well that dubiously bring the canon history of these characters into doubt. Bigby for instance has a hidden fortress that is presumably between the Shield Lands and the Bandit Kingdoms. His force of 800+ soldiers sometimes includes either elves or dwarves. Nowhere else in Greyhawk publication does Bigby sport this kind of might. He is either a shy, quiet mage posing as a merchant in the east or is hanging out in the Wild Coast/Greyhawk City as a Circle of Eight wizard. Also intriguing is Mordenkainen's sizable cavalry force of 4000 riding into the west (to aid an evil associate no less) and not coming back. So where are they? Did they go to the Obsidian Citadel in the Yatils? No further mention is made in Greyhawk publication to him having these troops. Mordy in later Greyhawk books has plenty of allies and guards but no need for ground cavalry. Worst yet is Robilar, whose forces make him look entirely capable of the treachery he is involved in during From the Ashes and Rary the Traitor. Robilar is well known for having Otto and Quij the orc as henchmen, but here he also has a 600 strong, lawful evil army, half of which are orcs. Robilar's keep west of Greyhawk is sacked for his misdeeds and the army hides out in the Pomarj region. So that means they are either bandits or perhaps allies of Turrosh Mak/Slave Lords? One other thought about wizard and warrior armies, the AD&D rules conveniently provided that every "name-level" PC gained a stronghold and attracted followers. This class design was surely meant to emulate and perpetuate the war-game facet of Greyhawk. The practice fell off fast in following editions of D&D of course. Okay, I won't even get into the rest of lists, find the issue and check it out. It's quite a good read, and maybe if you do want to do a war-based Greyhawk campaign, these troop lists will provide you with some inspiration for other special NPC units. This is the most attractive reason to like Greyhawk... wargame setting potential.